Nina Sharff, AmeriCorps volunteer Emily Simasek and Juliane Heydemann watch as Molly Park demonstrates how to make various coffee orders during an employee training at the Local Share in Wilton on Tuesday. In each nook and corner of Local Share, there is something new to discover. In the front, locally sourced goods. In the back, a coffee shop with comfy chairs and tables overlooking the river. In one corner, a play area for children. And downstairs, connected to the next-door Cadmus library, a reading nook. “We hope that if there are a lot of different reasons for people to come here, that this will become a central place,” explained Kimberly Dorn of Plowshare Farm on a tour of the new Main Street business, a few days before its official opening. The store is parented by the Plowshare Farm, and administered by the vendors that sell their goods in the space, along with Plowshare representatives. Vendors maintain the shop for a certain amount of hours in exchange for selling their goods in a central location, instead of an hourly wage, keeping the cost of business low. In addition, 20 percent of the profit from goods sold goes to pay the costs of keeping the space. The store was formerly located in Greenfield, under the same model, but the space they were in was small with no possibility for expansion, said Dorn. Moving to Wilton not only gave the store more space, but it allowed new features — like the reading nook and coffee shop. The coffee shop will be a by-donation venture, explained Dorn. While the shop will have a chalkboard menu with “suggested contributions” listed, the idea is for people to pay as much or as little as they can afford or think is fair. Though they will not own the space, workers from the Local Share will also begin to administer the next-door and attached Cadmus library. The Local Share’s reading room, filled with comfy chairs and plans for a book exchange, opens into the library through a connecting door, and residents will have access to the library during store hours. Dorn also hopes to see the store become a local gathering place, hosting various workshops during their off times, some already planned. They also plan to open the space to other groups that want to offer their own education workshops or other activities — those that offer them for free will be able to use the space for free, and those that charge will have to offer to offset costs. “We want to see, a few years down the road, this as a really warm, inviting place with people coming in and out all the time,” said Dorn. Local Share is the second shop to open on Main Street recently, joining a new antiques shop on the street, showing some signs of life for Main Street, which closed three storefronts this year — Roam Cafe, Antonia’s Greek Kitchen and Pizzeria, and The Color Shop and More, where Local Share now resides. With no restaurant on Main Street, local storeowners see the addition of a coffee shop, even one open part-time, as a positive addition for the neighborhood. Doug Nelson, owner of Nelson’s Candy, agreed that there is a need for a restaurant since the closing of Roam and Antonia’s, but said the concept of Local Share’s by-donation coffee shop seemed promising as a draw. Nelson, who has owned his store for 23 years, said that attracting in-town customers was a must for maintaining not only the Local Share, but every business on the street, since Route 101 bypasses the town center and much out-of-town traffic isn’t drawn into the Main Street. “I’ve seen a lot of people come and go, and I don’t know how to correct it. It’s a tough one,” said Nelson. Wilton is currently working on developing an Economic Development Committee, and is asking for input on the towns economic strengths and weaknesses via a survey posted on the town website, in an attempt to address growing the town’s economy. The shop’s hours are Wednesday, Thursday, Friday from 11 a.m. to 4:30 p.m., and Saturday 10 a.m. to 3 p.m. The shop will hold a grand opening event this Thursday through Saturday with free samples of baked goods, candle dipping. Thursday and Saturday Garrett Cameron will be performing live music in store from 3-4:30 p.m. Thursday and 11 a.m.-1 p.m. on Saturday. Local crafters who are interested in selling their products through Local Share should contact the store in person during store hours. When Terra Fletcher of Cloverly Farm stood up at a Greenfield Charrette meeting last year and suggested that she would like to see a coffee shop stocked with local goods in the downtown, she thought it was a nice idea that could be brought to fruition some time far down the road. She never expected another local organization to take the idea and run, nor that by that January that the dream would be realized. On Jan. 31, a group of local farmers and artisans opened Local Share, a community-supported store for locally sourced goods. And although the store is not yet a coffee shop, that’s the ultimate goal for those who are running it. For now, the store, run by its vendors, is a central place to sell their goods. They hope it will become a central meeting place for Greenfield residents. In that mix of works and goods on display are cayenne peppers, potatoes, garlic and onions from Cloverly Farm, wool slippers and yarns from Ten Talents farm, maple products from the Maple Guys in Lyndeborough and baked goods, granola and beeswax candles from Plowshare Farm. Kimberly Dorn, the director of Plowshare Farm, said she was attracted not only to the idea of a community-supported store for its own sake, but also as a way for some of the residents of Plowshare — people with mental or physical disabilities —, to interact with the community in a meaningful way. And indeed, Ellen Dumas of Ten Talents Farm, one of the vendors who sells goods at the store and mans the till just about every day the store has been open, said residents from Plowshare have been there often. Sometimes they are working on their own products — Dumas, who creates wool products, will sometimes work on her crochet side by side with them, in between customers. Other times, they volunteer to do cleaning and stocking, or handing out complimentary cookies to customers. The store is run by the farmers who contribute their goods to the stock. The store takes 20 percent of the sales to cover things like rent on the building, and volunteering helps to keep that percentage low enough that vendors can still make some profit without having to increase prices unduly, said Dorn. Other than that, the only requirement for selling in the store is contributing to managing it. Plowshare is sponsoring the store, and any gaps between the sales and costs of business will be made up by the farm for the first year of business, to see it get off the ground, said Dorn. m at the store that once occupied the space Local Share now occupies. But the store would have taken 40 percent of her sales, and that wasn’t sustainable without increasing her prices, she said. Dumas had even toyed with the idea of a similar community-supported store a few years ago, even starting a group called Greenfield Grows to explore the idea, but it never ultimately got off the ground. “This is an opportunity now, and Conrad [Dumas] and I are availing ourselves of this opportunity, and we’re going to see where it goes,” said Dumas. The hope is that it will grow into what Fletcher first proposed, said Dorn: a coffee shop that also sells local goods. The organizers even have an eye to expanding into the shop next door, if Local Share becomes a sustainable venture. Until that day, though, they will continue to be open four days a week for the purchase of locally crafted food and goods. Local Share is open between 10:30 a.m. and 1 p.m., Thursday through Sunday, and is located at the Greenfield Meeting Place on 4 Slip Rd. Ashley Saari can be reached at 924-7172 ex. 244, or asaari@ledgertranscript.com. Electric Earth Concerts was founded in January 2012 by Laura Gilbert, Jonathan Bagg and Miki Osgood. 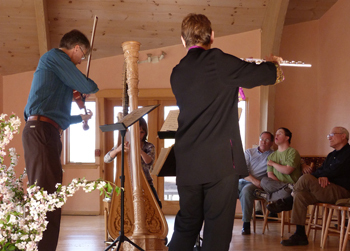 One aspect of their mission is to give affordable public concerts in the Monadnock Region that are meant to inspire, educate, and entertain, often looking beyond music to its connections to literature, dance, and visual art. The other aspect of the parent organization, Music for the Mountain, is to bring music into communities where it can make a difference--to schools, shelters, rehabilitation centers, and homes for the disabled. Music for the Mountain believes that music's enlightening and healing power ought not to be limited by boundaries of access. For more information on Electric Earth Concerts and the Music for the Mountain series visit www.electricearthconcerts.org. Plowshare Farm has been lucky to welcome Music for the Mountain musicians back several times a year. For upcoming concerts visit the Events page. Read an article about their first performance at Plowshare Farm in the Monadnock United Way U Review here.